For example, if Idaho had been in the compact in 2016, and if the compact were in force, the state's four Electoral College votes would have been cast for Hillary Clinton even though Donald Trump beat her by more than a two-to-one margin there, because Clinton won more votes nationwide. Idaho is one state where NPV legislation is pending this year, but the compact has no chance of advancing there because the state currently has a Republican trifecta, and Republicans nationwide have been united in opposition to the NPV. Colorado and New Mexico, however, became completely aligned under Democratic control this January. In New Mexico, the governor's seat changed parties when Democrat Michelle Lujan Grisham won the 2018 race after Republican governor Susana Martinez was term limited. In Colorado, voters turned the state senate from Republican control to Democrat. Last week, the NPV passed its first hurdles in both the Colorado Senate, and in the New Mexico House. If both states were to pass the legislation, it would add another 14 Electoral College votes, bringing the NPV tally 186. "The NPV compact is unconstitutional and bad public policy," wrote Heritage Foundation senior fellow Hans von Spakovsky in a 2011 editorial that echoed the sentiments of most who oppose it. "It would undermine the protections of the Electoral College, elevating the importance of big urban centers like New York and Los Angeles while diminishing the influence of smaller states and rural areas. That was a major reason for establishing the Electoral College in the first place: to prevent elections from becoming contests where presidential candidates would simply campaign in big cities for votes." Although NPV efforts have been underway for more than a decade, supporters were reenergized after President Trump's election, where he won the Electoral College Vote by 304-227, but Clinton pulled in about 2.9 million more individual votes nationwide. Supporters usually rally around the "one person, one vote" mantra, but disproportionate representation has always existed, for example, in the U.S. Senate. One of the bill sponsors in Colorado was asked on a recent talk radio show if he was also concerned about disproportionate representation in the senate. "Well, that's totally different than what we're talking about now," Colorado state senator Mike Foote said on 710 KNUS. "Of course, that's something that requires a constitutional amendment, and that's way beyond the scope of the national popular vote." Foote also said when he challenges people to show him how the Constitution specifically prohibits the NVP, they are unable to do so. However, Rob Natelson, a constitutional scholar in Colorado published a lengthy argument against the NPV replete with case law. 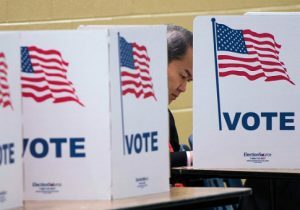 "In deciding how electors are appointed, state lawmakers may choose among a range of procedures," Natelson concluded. "But they have a constitutional duty to choose a method consistent with the electoral system's purpose and design. Attempting to convert electors into agents of other states—like selling them to the highest bidder—would be an unconstitutional breach of public trust." The states already in the NVP compact are: Hawaii, Washington, California, Illinois, Maryland, New Jersey, New York, Connecticut, Rhode Island, Massachusetts, Vermont, and the District of Columbia.